This book is an unique exposition attempted effectively and exhaustively on the science and technology of the architectural wonder i.e. 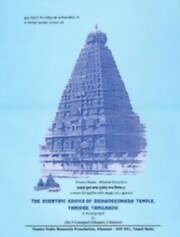 the great Brihadeeswara Temple situated at Tanjore, designed and constructed by one of the great grandfathers of Dr.Ganapati Sthapati, Kunjra Mallan Raja Raja Perunthachan, during the 10th century AD under the patronage of King Raja Raja Chozhan. The ancient Indian science of Vaastu Shastra finds fullest expression in this magnificent edifice and Sthapati has elucidated in as simple terms as possible the science that has gone into its making, which makes an interested reading for seasoned readers as wells as newly initiated aspirants. Born in the year 1927, at Pillayarpatti, a village near Karaikudi, Tamilnadu, Dr. V. Ganapati Sthapati comes from an illustrious family of temple architects and sculptors. His family lineage stretches back over one hundred decades including the sthapatis who created the great Brihadeeswara Temple of Tanjore, the treasure house of Indian art and architecture. Son of Sri Vaidyanatha Sthapati, a renowned sculptor and Sanskrit scholar, he has made remarkable contributions to the field of art and architecture. As the Doyen of Indian Vaastu Shastra (recently given the title of "Shilpi Guru" by the President of India) he has been doing research in the field of Vaastu Science and Technology for the past 50 years. A graduate in Mathematics and Sanskrit, Sthapati is propagating this supreme science in India and abroad. He is solely responsible for the resurrection of the works of the Great Brahmarishi Mayan, who was the progenitor of this Indian science and technology and the founder of this rich civilization and culture. As the Principal of the Government College of Architecture and Sculpture (the only institute of this kind in the world) at Mamallapuram, near Chennai, for 27 years, Sthapati worked hard to restore and elevate the status of the sacred art and architecture by affiliating courses to the University of Madras and offering degree courses. This brought academic status to the age-old tradition of learning and also initiated many young people into this traditional technology. After retirement from government service, he established Vaastu Vedic Trust and Vaastu Vedic Research Foundation aimed at research, development and globalization of Vaastu Shastra. He is also the head of the professional guild named V. Ganapati Sthapati & Associates. This group of talented designers, engineers and craftsmen work together to create Vaastu inspired temples and other buildings in India and abroad. The palatial buildings of library and administrative block for Tamil University of Tanjore and the Muthiah Mandram in Madurai speak of his capacity for designing and executing works of stupendous nature. Of particular interest is his monumental vaastu sculpture/building of Thiruvalluvar at the southern tip of India at Kanya Kumari measuring 133 feet in elevation: a stone statue of liberty for India. This colossal marvel has taken him to the pinnacle of his life's achievement as a traditional architect and builder and commendations and awards have reached him from around the world for this achievement: a poetic image that will be with us for thousands of years. He has authored a number of books on the science and technology of Vastu Shastra and has conducted numerous seminars with professionals in a generous effort to make this knowledge available to the world. He has established the International Institute of Mayonic Science and Technology, which conducts workshops and discourses all over the world. Sthapati holds the post of the Professor and the Head of the Department of Sthapatya Veda in the World University of Traditional Indian Science, Technology and Culture in Chennai. Some of the notable books he has authored include: Iconometry, Temples of Space Science, The Building Architecture of Sthapatya Veda, and Commentary on Mayan's Aintiram. Sthapati has earned a number of titles and awards including an Honorary Fellowship by the Indian Institute of Architects, the National award for Master Craftsmanship by the President of India, the title of "Shilpi Guru of India" also by the President and a Doctorate Degree conferred by the Maharishi Mahesh Yogi Vedic University. He has worked and researched the USA, U.K., Australia, France, Fiji, Germany, Holland, Singapore, Malaysia, Mexico, Guatemala and Peru. This pulsating and vibrant researcher, sculptor, architect, philosopher and scientist has given forth many startling research discoveries on the intricacies of the traditional art and architecture of India and is quite optimistic that one day Vaastu science will be a major influence in the world. He has identified the theories of the origin of the Universe and its life forms through his research on the works of Mayan scaling height far beyond the mundane world of modern science and technology. What is a Temple? What is its Significance?